add antonyms, synonyms, register, etc. Context-based search differs from a headword or non-headword search in one important aspect: all other searches are based on the fact that the particular keyword should be available in the resulting term. Context-based search works with a particular criterion which may not contain the search term. See the screenshot below. You want to write a passage relating to the personalities of two characters. For this purpose you would like to browse through all collocations relating to personality. 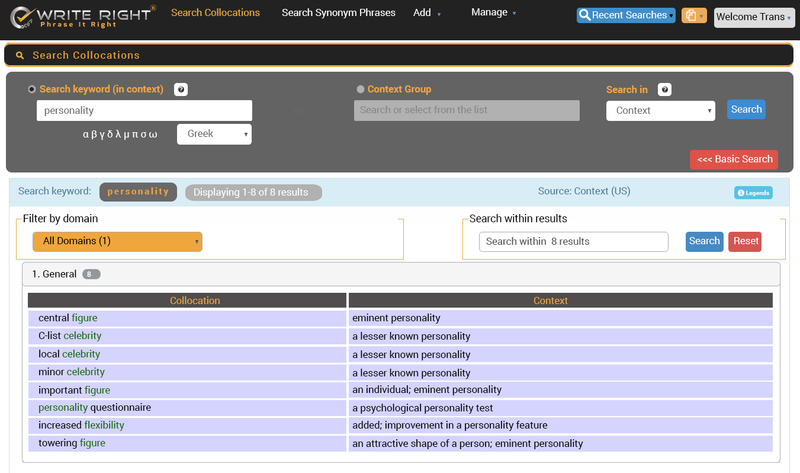 Under Advanced Search, enter the keyword (personality) as shown below and select Context under Search in. We can select Personality (Unpleasant) to shortlist the results and click on Search. The screenshot below shows the search results. Which method to use in a given situation? The ideal way would be to first search for a context word under Context Group. If the desired result is not found, you can search under the more comprehensive search field Search keyword (in context). Context Group makes it easier for you to browse through the list of collocations which are grouped under a particular context. If that context matches with the type of collocations you are looking for, you may check out these search results. Please note that if the possible context does not display any results, you can try with a synonym term. If that also finds no results, you will need to search for different headwords that relate to the criteria you are searching for. For example, if the criterion is “joyous event”, you can search for headwords that relate to it (for example, joy, laughter, celebration, etc. ).